Asa Gray was America's foremost discoverer and systematizer of U.S. plant life. For more than a century, his Manual of Botany remained the outstanding work in its field. Gray's work placed him at the head of all U.S. botanists and on a level with the most famous botanists of the world. ■ Asa Gray was born November 18, 1810, in Sanquoit, N.Y. He was a great-grandson of Scottish emigrant John Gray who came to the American colonies in 1718. ■ He studied medicine and chemistry at Fairfield Academy. However, his chief interest was plant life which he started collecting and identifying about the year 1827. ■ His first botanical textbook Elements of Botany appeared in 1836. He also wrote Elements of Biology and Why Plants Grow followed by other textbooks. 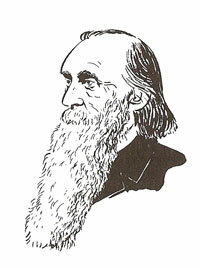 In 1878 he collaborated on Flora and Synoptical Flora. ■ His most important work was Manual of the Botany of the Northern U.S. Even today it is considered the indispensable book for the student of American botany. ■ In 1842, Gray became Fisher professor of natural history at Harvard University. While at Harvard, he set up the largest and most valuable herbarium in the U.S. At the same time, he put together an extensive library on plant life which had not existed before. ■ In 1872 he was elected president of the American Society for the Advancement of Science. He was also a charter member of the National Academy of Science. He died January 30, 1888, in Cambridge, Massachusetts. ■ During his lifetime, Gray was a prolific writer on natural history. He backed Charles Darwin's theory that present plant species evolved from previously existing species.